An interesting announcement coming straight from the New York Stock Exchange (NYSE) about the lauch of the first exchange-calculated and disseminated bitcoin index – NYSE Bitcoin Index (NYXBT). The new NYXBT Index will represent the U.S. dollar value of one bitcoin unit based upon actual transactions occurring on select bitcoin exchanges which have been evaluated and meet NYSE’s quality standards. The NYSE Bitcoin Index will initially feature data from transactions from the Coinbase Exchange, an exchange that NYSE made a minority investment in earlier this year. NYXBT utilizes a unique methodology that relies on rules-based logic to analyze a dataset of matched transactions and verify the integrity of the data to ultimately produce an objective and fair daily value for one bitcoin in U.S. Dollars as of 16:00 London time. 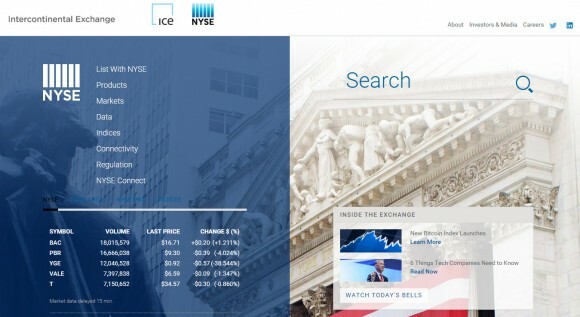 The index will be published within a short period of that time via the widely-distributed NYSE Global Index Feed (GIF) as well as made publicly available for an initial period on the NYSE index page.